It’s better to wait until our newborn is five or six and can learn to ski. 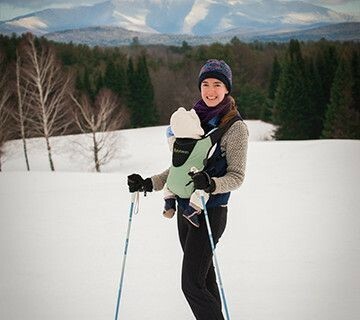 It can’t be done – there’s no way that I can ski and have my baby around. It will cost a fortune. None of these is necessarily true. But you certainly need to do your homework before deciding to take a baby on a ski holiday. There are some companies that are much more committed to baby-friendly skiing trips than others. So if you don’t want to put your skiing on hold for half a decade. Here’s our guide to finding the right family ski trip for you. Each tour operator has a different focus. Some accept children from birth, some from six months, some from two years etc. Read the small print carefully and understand what’s actually on offer. Then ask questions about travel cots and linens, potties, sterilisers, changing mats and baby monitors. Being really clear about what’s provided and what you need to bring with you can save you from having a holiday disaster. Nappies are a key point. Several tour operators like Family Ski will send you a nappy order form so that your desired number and size of nappy will be waiting for you in your chalet. It’s crucial to understand that your baby may be affected by altitude. But then, so may you. Mild symptoms of altitude sickness may happen around 2,500 metres above sea level. Which is quite a commonplace height for European ski runs. Severe altitude sickness begins at around 3,6000 metres which is way over the height of most European ski runs. In the UK you simply won’t develop altitude sickness as the highest mountain here is 1,344 metres – too low for the air to affect you or your baby. So if you want to travel with a baby, check out the height not just of the runs but the chalet altitude, or you may end up with a very whiny baby! If your baby has any serious medical problems like a heart defect, check with your GP before taking her skiing as altitude can worsen such conditions. Erna Low offers self-drive holidays to resorts across Austria, France, Italy and Switzerland, all of which fall below the altitude problem limit. They also advise that if you’re travelling with them, you book a baby kit in advance and that (a) your baby cot may not fit in your bedroom and (b) many resorts will expect you to bring your own cot linens. For companies like Crystal Ski, organising childcare for families with several children is all part of the deal. For babies under six months, the provide a nanny (at extra cost) whilst from six months to four years they offer Pepi Penguin nurseries which provide six days of childcare in dedicated nurseries that take a maximum of eight children at resorts in France and Italy – this is nursery care for non-skiing children. Finding the balance between skiing opportunities and non-skiing activity can be more difficult, especially for parents who love to ski and can’t understand why their little ones are struggling in a ski class where all the children speak French and have already got their ski legs. It’s important that you, your nanny or another relative be prepared to take some time from the slopes to spend with children if they are really unhappy at full time ski-classes.